Devon clams from the Dartmouth estuary can’t be beaten at this time of year, so good in fact, that we ate them on Christmas day, followed by a stupendous turbot. 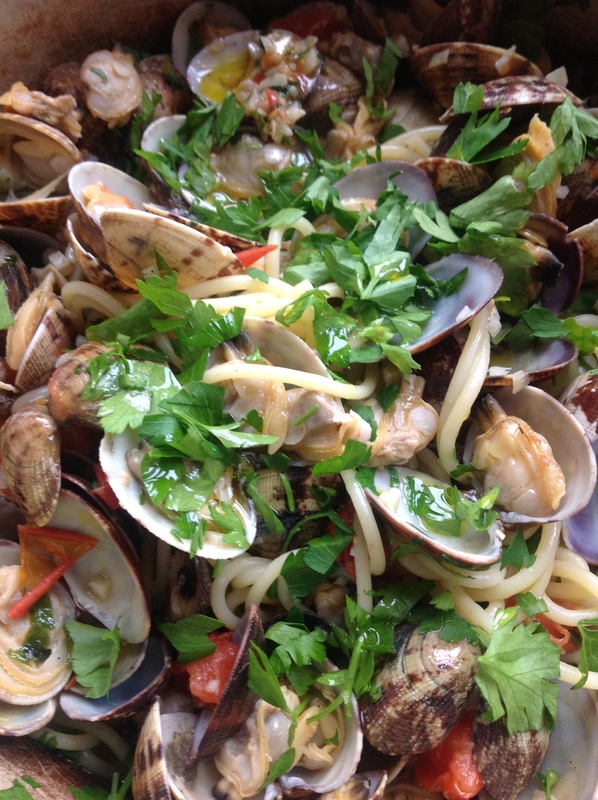 This dish tastes of the sea and makes a superb supper dish in just 15 minutes. Take a look at the packet instructions of your spaghetti and notice the recommended cooking time because you will need to know ( in this case,11 minutes). You will also need a timer. Take a large pan and put it on the heat to boil. Meanwhile sort through the clams and discard any that are open. Then peel and chop the garlic and shallot, measure out the wine and make sure the tomatoes, oil and butter are near at hand. When the water is boiling, add the spaghetti with some salt, swirl it into the water and bring back to the boil. Start your timer. At the same time, place another empty pan on the stove to heat up. With 5 minutes to go on your pasta (6 minutes into the cooking time for mine), add the olive oil and butter to the hot, empty pan. 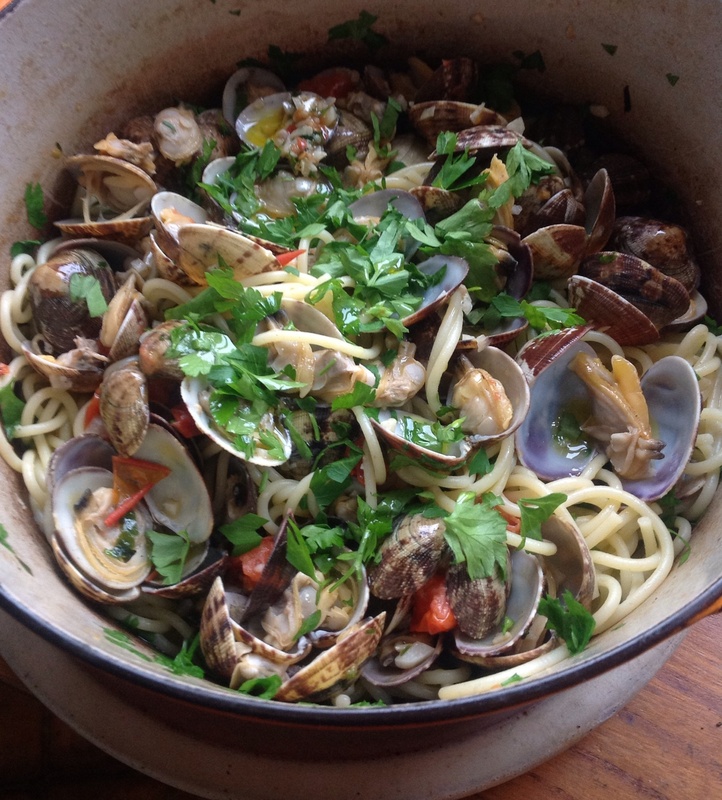 Throw in the garlic and chopped shallot, wait for a few seconds then tip in the clams and the wine. Shake them about. Place a lid on the pan, give it a last shake and replace on the heat. 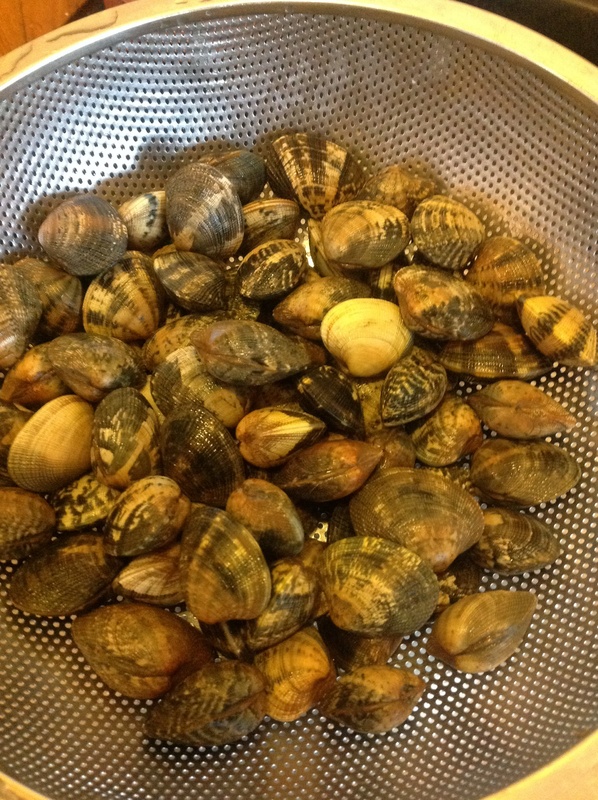 After 3 or four minutes the clams will start to open and release their juices so shake the pan to move them around. Remove the lid of the clam pot and check the clams are all open, then add the spaghetti and tomatoes. Stir and toss for another minute or so to let the delicious juices become absorbed into the pasta. Season to taste with salt and pepper and serve scattered with the parsley.